Here are the results of the first question of a February 2018 YouGov poll of 8,215 adults in the US. They probably ought to have asked if antisocial media was involved in any recent formation of doubts, because of course it was, because it’s fundamentally and irretrievably antisocial. 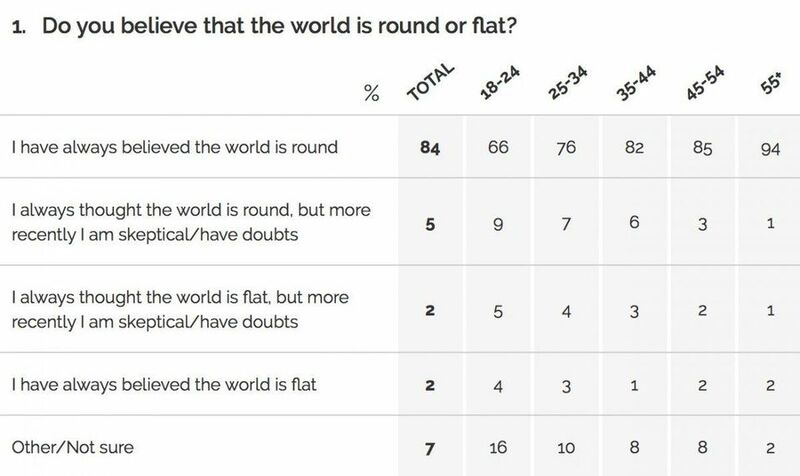 An interesting Venn diagram would show the intersection of 18-24 year-old oblate spheroid-doubters with those of that age who would like to work at a cool place like SpaceX. I would bet a crisp new one dollar bill that it’s not a null set. Oh, you want to fall down the rabbit hole, go on tumblr. It makes me long for the days of usenet. When the Earth was still cooling, I was the moderator of a forum on CompuServe for a couple of years. With the behind-the-scenes right in front of me every day, I alternately winced, grimaced, and trembled because I could quite clearly see all this chaos coming from decades away. I even had a stalker there, because people are nuts.